You can cancel or modify your reservation, but always taking into account that the refund applies to the payment of the booking fee. All owners have different cancellation policies specified in the reservation form. If you have any other questions, please visit our FAQ page or get in contact with us. Have you made a reservation and changed your mind in the next 24 hours? All you need to do is send us an email! 100% refund guaranteed Have your plans changed and you need to cancel your booking in more than 1 month before your arrival? 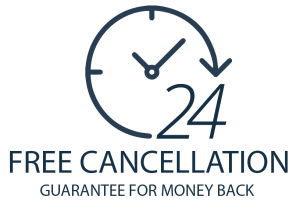 70% of the booking fee refunded If you decide to cancel your reservation in less than 1 month before your arrival. 40% of the booking fee refunded In less than 24 hours before your arrival date no refund will be guaranteed.